I don’t include much nonfiction in my leisure reading because I read so much of it for work. At libraries and book stores, I browse through the latest nonfiction releases to see what kinds of history topics attract editors and publishers. I saw Kurtz’s book at the library, leafed through it, and couldn’t put it down. Kurtz’s grandparents embarked on a European vacation in 1938, the year before the Second World War broke out. His grandfather, David, had a new movie camera with him. One of their stops was in David’s hometown in Poland, where he shot three minutes of film. Seventy years later, Glenn Kurtz found the reel and became mesmerized by the images it captured. 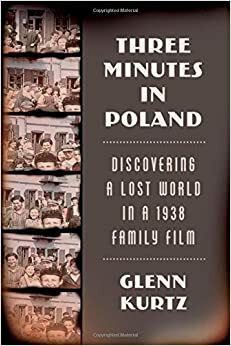 Realizing his grandfather had documented life in a predominantly Jewish town right before the Holocaust, Kurtz set out to discover what happened to the people in the home movie. The resulting story is a haunting, personal account of the devastation of war and genocide.